"Traditional seasonings for southern greens are bacon grease or ham. This healthier version is a delicious alternative. Serve as-is or with sauteed bell peppers, onions, and garlic." Bring chicken broth, water, oil, salt, and pepper to a boil in a stockpot. Add turnip greens and sugar and return to a boil; reduce heat to medium-low and simmer, stirring every 15 minutes, until greens are tender, at least 30 minutes or up to 2 hours. A southern-style take on green beans! You can substitute collard greens for turnip greens. These were delicious and I have never cared for greens. I added a tablespoon of bacon drippings and some chopped ham pieces. Excellent! The only thing I did different was less sugar ( about 2 tbsps). Tastes just like my grandmother used to make. Thank you! 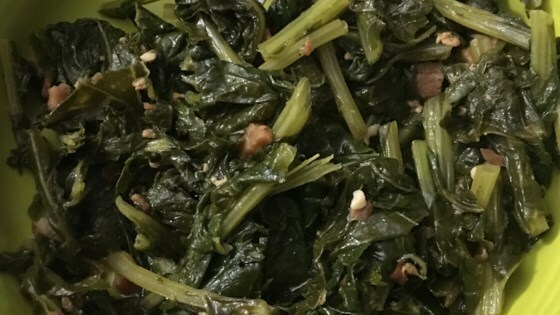 Best turnip greens recipe yet. 8 year old had seconds!! Easy and good!! I didn't add the salt or sugar.